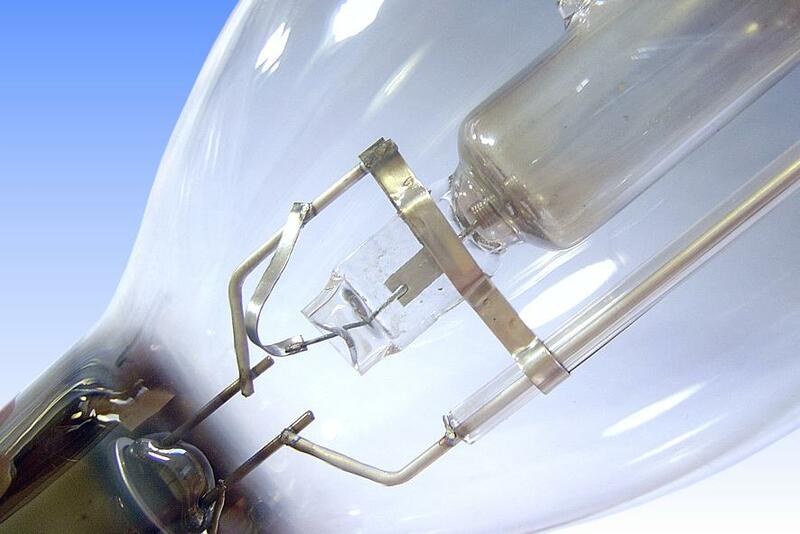 This lamp is a special variant of Narva's coloured metal halide family. 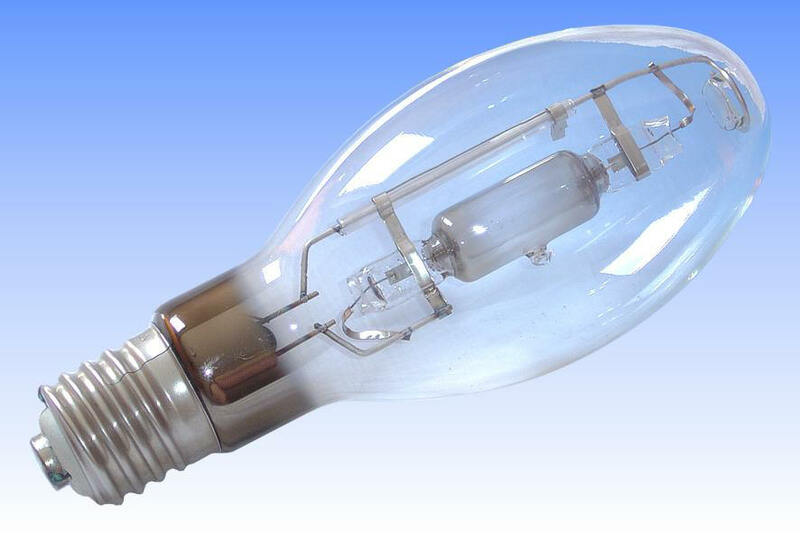 It is based on the NC400-64 blue coloured indium lamp, but the dose chemistry has been modified to include halides of gallium and lithium. 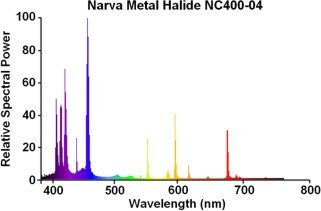 Gallium in particular adds a strong blue and several UV peaks in the spectrum. The application of this lamp was for medicinal purposes, its output being developed to provide a suitable treatment for the skin condition of jaundice. Traditionally this is treated with large banks of linear fluorescent lamps, also having specially modified spectrum, which serves to break down bilirubin in the blood which causes the jaundice effect. Blue light around 450nm is the most effective for this treatment. Indium provides this quite efficiently, while gallium adds extra output around 417nm. Lithium is probably present as an impurity, from the quartz. More light is also beneficial for the treatment, even if the wavelength is not in the most useful region. It also provides a whiter colour light, which makes it somewhat easier to observe the skin condition during treatment. The addition of other metals such as thallium or sodium would result in a decrease of the blue energy. The physical lamp design is very similar to that of similar Tesla products, with whom Narva had much contact. The arc tube is made from three pieces of quartz, and small end chambers around the electrodes serve to maintain a high temperature here. The outer jacket is also of the Tesla style, blown blown as usual, with the dimple added afterwards by a special vacuum-forming technique. A quartz sleeve over the side frame wire serves to reduce loss of lithium from the arc tube by the photoelectric effect. References: 1) Private communication, Stanislav Slabyhoudek.